Click here for instructions on how to bump. You can BUMP your 10 items every 2 hours, with a 2 hour "rest" before an item can be bumped again. You can think of bump limits as a set of 10 timers that can all run at the same time. Once you bump an item, that bump timer starts running. You can bump 9 other items, each using one of your bump timers. Once a timer has counted down 2 hours, you can bump another item. Note: Small Business Directory posts will not have bump arrows, as those posts are not able to be bumped. 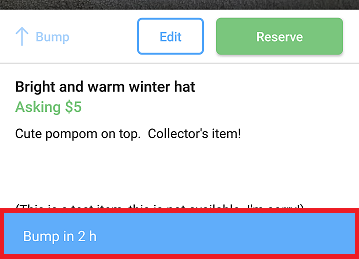 When viewing your item, you'll see the bump button, but it will be grayed out if you have no bumps available or that item has not "rested" 2 hours. On iOS you will see when you can bump again. On Android, you can tap the bump arrow to see when you will be able to bump again. You'll also get a notification showing how many bumps you have left each time you bump. Your bump arrows will grey out once you have used all your bumps. 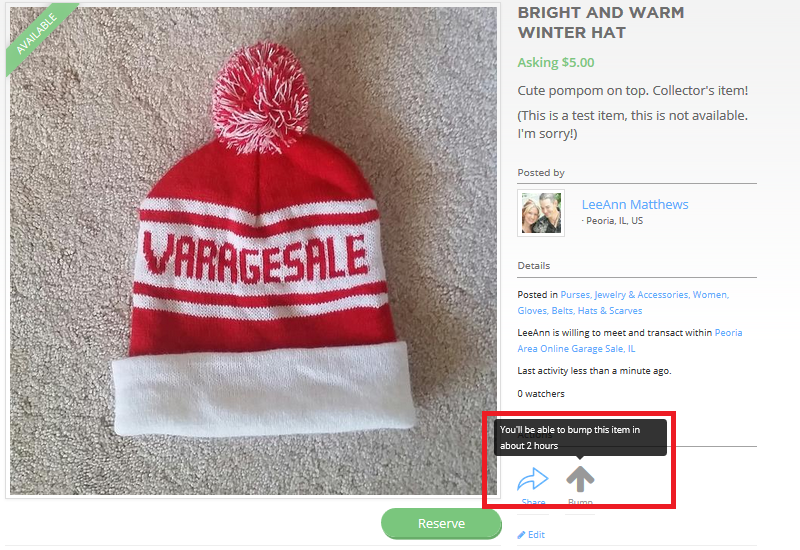 If you hover over the grey arrow, you'll see how much longer you have left until you can bump that item again. 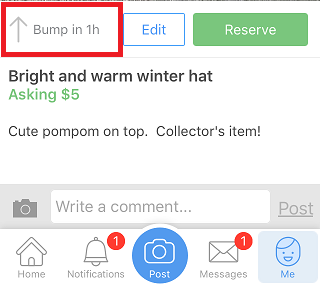 You'll get a notification each time you bump letting you know how many total bumps you have left before you reach your limit.